Looking at these spiral galaxies glowing brightly against the dark, it’s hard to imagine that they could be so easily missed—but they were right up until now, when an astronomical survey catalogued them as equal to the biggest and brightest galaxies ever seen. Although they’re quite comparable in their shape and their behavior, they dwarf spiral galaxies as we know them. They have more than 10 times the mass of the Milky Way, anywhere from 8-14 times its brightness, and 30 times its star-formation ability. It’s that incredible star-formation ability, though, that also has astronomers questioning everything they know about spiral galaxies. Current theories say super spirals this size shouldn’t be able to keep themselves together at all. 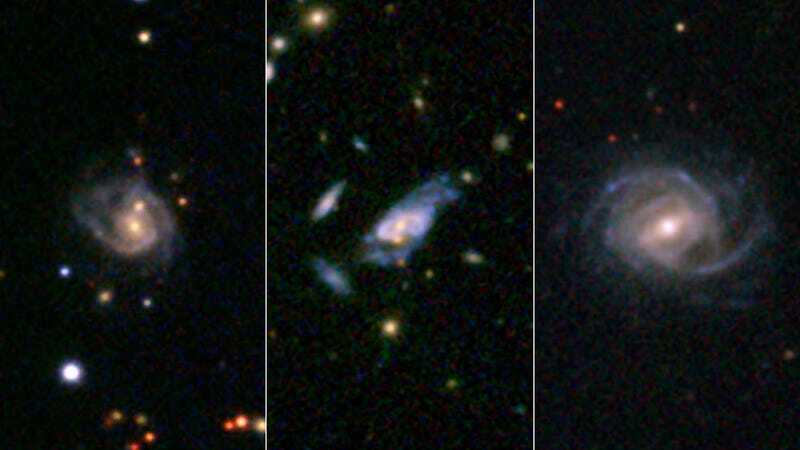 As spiral galaxies grow, they pull in more and more surrounding gases to build stars. As they keep pulling, they eventually hit a point where they have too much surrounding gas and, instead of growing new stars, it extinguishes them. Yet, mysteriously, these super spirals seem to be almost unlimited in both how big they can get and how many stars they can build.